Since I didn't get to see the actual fashion show at Macy's I went to their website and picked a couple outfits to use as inspiration for these fall fashion inspired nails. For my first look I picked this black and white Bar III Mixed Media Dress because I loved the graphic print and the rose gold zipper accents. It's kind of hard to see the zippers in the picture above, but if you check it out on the Macy's site they have a nice picture that you can zoom in on to see the details. I started with two coats of Sinful Colors, Snow Me White. Next I used the distressed technique to create the print of the dress. This technique is done by wiping most of the paint off the brush before lightly dragging it over the base color. I used Sinful Colors, Black on Black for all the black accents. For the insets I used a small nail art brush and started by outlining the half circles at the side of each nail, then filled them in with black polish. I went back after that was dry and outlined the black areas with my rose gold polish- Orly, Rage. This is my favorite look of the two. I just needed an excuse to use Rage again. Such a perfect rose gold color that I don't get to use often enough. 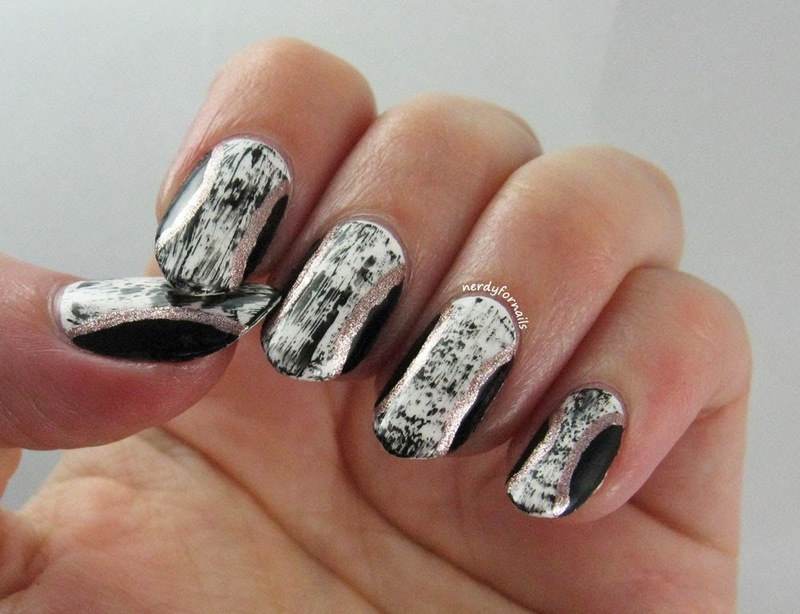 My second set of nails was inspired by this Rachel Roy Marble Print Dress. 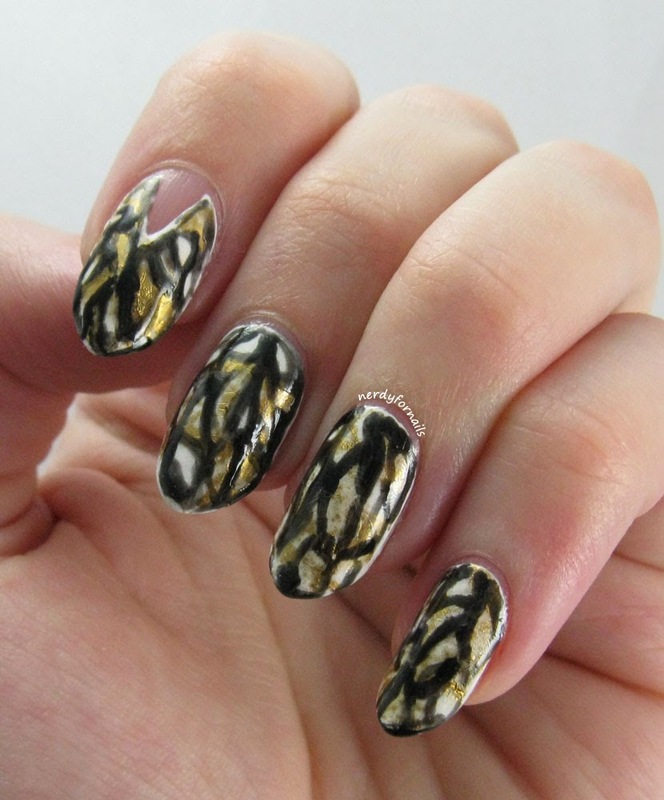 I had some gold marble foil that I thought would be perfect for this manicure. I started with two coats of white polish. I used a cleanup brush and acetone to erase the triangle cut out on my index finger to mimic the neckline, but remembering to tape it off in the first place would have also worked. I painted all the white parts of my nails with foil glue and waited for it to get clear and tacky before pressing the foil onto my nails. 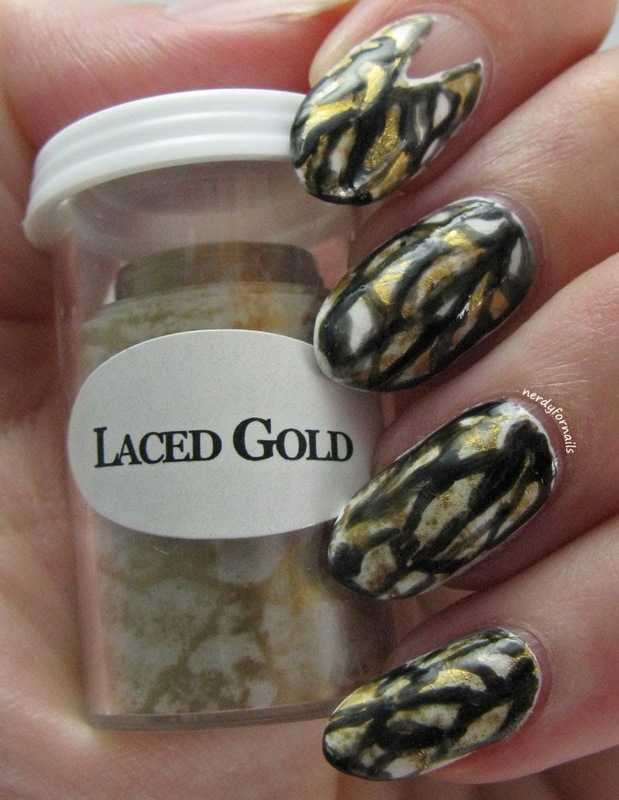 This Laced Gold foil is from Dollar Nail Art. For the black accents I mixed a drop of black with a drop of clear polish to give it the smoky look the dress has and painted on random lines with a small nail art brush. I loved doing these fashion inspired nails. Which look is your favorite?